Anybody who follows Nando's on Twitter will know that they are excellent at engaging with their customers and building their brand via the social network, through such initiatives as #NandosFriday. But Nando's really showed their social prowess this week, piggybacking on the retirment of legendary football manager Alex Ferguson. The outgoing Manchester United manager is famous for "Fergie Time", which are lengthy periods of additional time at the end of football matches and United usually prosper during these minutes. 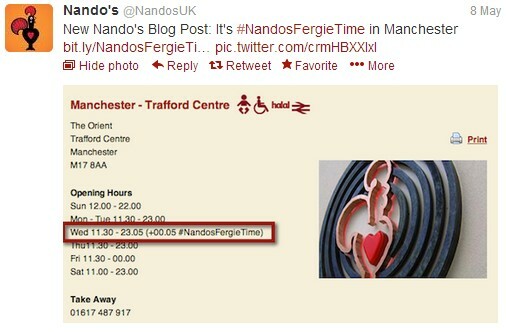 When his retirement was announced on Wednesday, Nando's extended the opening hours of their Manchester branches by 5 minutes and numerous tweets followed. Linking their product/service to this breaking news story, in an incredibly inventive way, led to hundreds of retweets and favourites and, most importantly, exposure.